Dhaka, Nov 22 (Just News) : Dhaka stocks dropped on Tuesday, snapping a three-day bull run as investors preferred to book profits, especially from bank scrips following their recent gains. 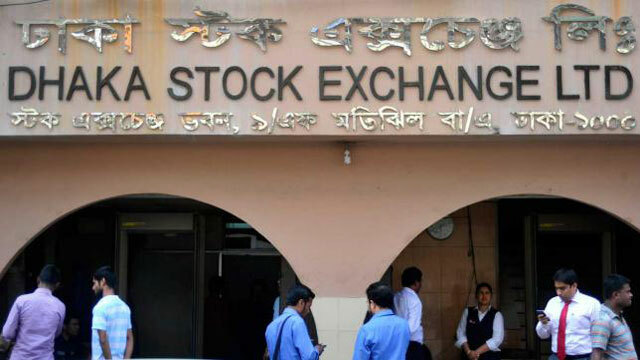 The key index of Dhaka Stock Exchange, DSEX, lost 0.58 per cent, or 37.25 points, to close at 6,281.87 points on Tuesday after gaining 83 points in the previous three sessions. Although the market began the day with an upward trend, the trend did not sustain for long and the market moved downwards soon as investors preferred to book profits, market operators said. The core index witnessed a record-breaking rally in recent days that upped share prices of most of the scrips and therefore investors went for locking in some gains from the shares that gained in recent times, they said. A section of investors also went for share selling fearing that share prices of most of the scrips could fall following their recent surges. As a result, the average share prices of banks dropped by 1.33 per cent on the day following their recent contribution to the market rally. Out of the 30 traded banks, 26 scrips declined and just four advanced on the day. Besides, cement, telecommunications and pharmaceuticals declined by 1.5 per cent, 1.4 per cent and 0.9 per cent respectively on the profit-taking moves from a section of investors. The share prices of Square Pharmaceuticals, BRAC Bank and Grameenphone declined by 1.87 per cent, 1.50 per cent and 1.42 per cent respectively after their recent surges. A section of investors also reshuffled their portfolios to invest in other scrips that have better prospects, stockbrokers said. Energy and engineering scrips gained 0.6 per cent and 0.2 per cent respectively. Turnover on the bourse, an important indicator of the investors’ participation, declined to Tk 1,091.90 crore compared with that of Tk 1,158.49 crore in the previous session. Of the 330 companies and mutual funds traded, 164 declined, 132 advanced and 34 remained unchanged. ‘Investors’ profit-taking stance triggered the index to plummet,’ said EBL Securities in its daily market commentary. The positive movement seen in the morning session was short-lived as investors spurred selling pressure on sector specific stocks especially from bank, telecommunications, and pharmaceuticals sectors, it said. DS30, the blue-chip index, shed 0.76 per cent, or 17.38 points, to finish at 2,268.73 points. Shariah index DSES dropped by 0.79 per cent, or 11.00 points, to close at 1,381.72 points. LankaBangla Finance led the turnover chart on the day with its shares worth Tk 86.71 crore changing hands. AB Bank, Dhaka Bank, Shahjalal Islami Bank, FAS Finance, City Bank, BD Thai, Grameenphone, Square Pharmaceuticals and BRAC Bank were the other turnover leaders. Eastern Cables increased the most with a 10-per cent rise in its share prices, while Aman Feed was the worst sufferer on the day, shedding 11 per cent.